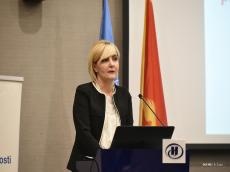 Montenegro and Azerbaijan have a room to develop cooperation in other areas in addition to tourism and energy, Economy Minister of Montenegro Dragica Sekulic said in an interview with Trend. "The cooperation between Montenegro and Azerbaijan in tourism is a well-known fact, thanks to the major investment of Azmont Investments in the "Portonovi" project. In addition to tourism and energy, there is surely room for the improvement of cooperation in other areas as well, such as commerce, industry, mining, transport, agriculture, science and education, information society and telecommunications," she said. The minister believes that the economic cooperation between Azerbaijan and Montenegro can be improved by implementing the Agreement on Economic Cooperation and the Agreement on Protection and Mutual Promotion of Investments. "It was agreed in our regularly held meetings that both countries shall promote investment opportunities and business environment through regular contacts between line institutions," said Sekulic. Montenegrin minister went on to add that having in mind the big investments coming in from Azerbaijan, it is a fact that the commodity exchange between the two countries is not at a high level. "This is certainly affected by the geographical distance between us which could be mitigated with better connectivity and infrastructure. To this end, there is room for the drafting of projects of mutual interest, and parallel to this, we need to work together on establishing stronger ties between companies from both countries," she said. Portonovi resort is one of the largest projects in the territory of Montenegro. The developer of the project is Azerbaijan’s Montenegro-based Azmont Investments company.